Tintin Heart: It's beginning to look a lot like Christmas! This is Christmas Wreath I've made for my door using ivy from the garden, some glitter covered decorations and finished off with some red ribbons. The base is a plain wicker ring. This is for the challenge at the The Crafty Bloggers Network . OK it's not paper or a card but it is 3D! As the main door is on the north side of the house and doesn't get a lot of sun, anything that brightens up the area is welcome. 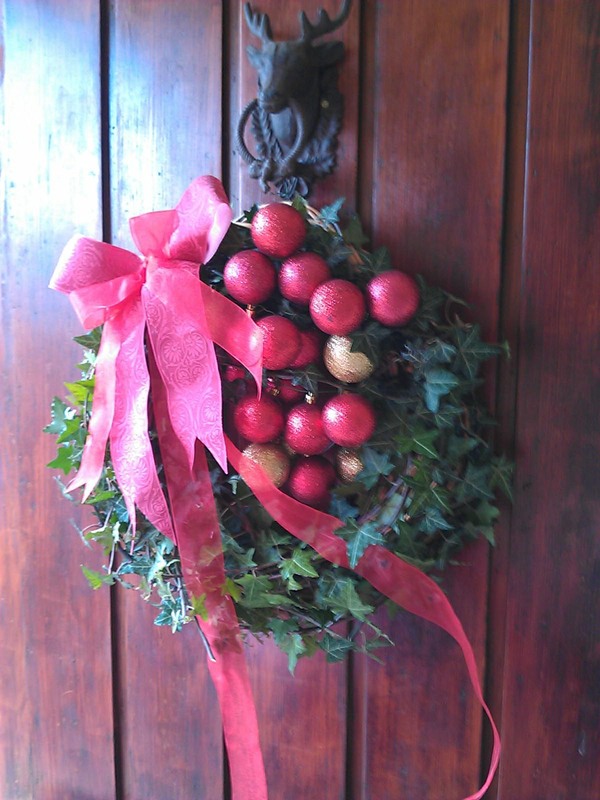 The red and gold baubles look great against the dark leaves of the ivy and the ribbon, set off-centre, completes the wreath. I'm very pleased with this. Thanks for you kind comment on my blog! This is simply stunning!!!! I do so love the wreath and the baubles and ribbon make it just POP!!! Wow, it definitely makes me feel Christmassy just looking at it. Wow, this is so beautiful Angela!